You may create a control that adds a schedule button in HTML Composer. A schedule button enables you to schedule a report, or graph, using ReportCaster. Once you have created the schedule, you can access the ReportCaster HTML User Interface to edit and maintain information about the schedule. Note: The Schedule option is only available in HTML Composer if your WebFOCUS environment is licensed to use ReportCaster. Only procedures referenced in HTML Composer are able to be scheduled. When referencing an existing procedure with parameters in HTML Composer, the schedule button is automatically added. You may also manually create schedule buttons for your report or graph. Controls appear when you reference a report or graph with parameters. HTML Composer automatically adds a control, Run button, Reset button, and Schedule button for the parameters in your layout, if your WebFOCUS environment is licensed to use ReportCaster. The Form settings dialog box sets when the schedule button appears with the controls. The Schedule button is selected by default. Deselect the Add schedule button. Note: If you deselect this option, you have the ability to manually add a schedule button. For more information, see How to Manually Add a Schedule Button. This procedure provides instructions on how to automatically add a schedule button to an HTML page for a referenced procedure in the layout. 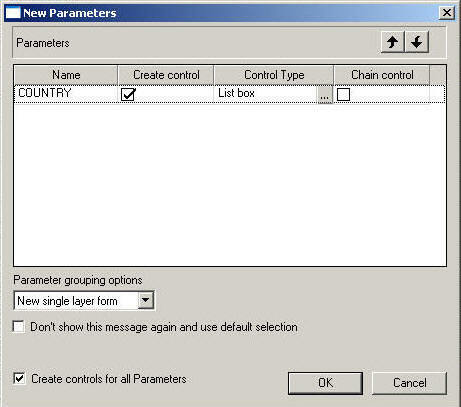 The New Parameters dialog box appears, as shown in the following image. The Run, Reset, and Schedule buttons appear with the parameters on the HTML page. Optionally, select the schedule button on the HTML page to view or edit the properties. The properties appear in the HTML Composer Properties window. Double-click in the Title properties value field to set the title of the schedule page window. The default title for the schedule page window is domain\standard reports\folder\foldername. You may change this to the text of your choice. Optionally, you may launch the Hyperlink properties for the schedule button to change the template for the schedule page. For more information about changing the template for the schedule page, see How to Change the Default Template for the Schedule Page. This procedure provides instructions on how to manually add a schedule button to a HTML page. This is useful for adding new, or additional, schedule buttons to a report or graph that has already been referenced to the HTML page, or if you are referencing a report or graph without parameters. 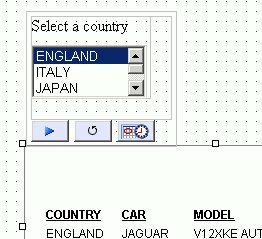 From HTML Composer, select a control from the Controls or Components submenu of the Insert menu. You may insert a push button, image, or hyperlink as a schedule button. Drag the crosshair to add the push button object and adjust it to the size you want. Right-click the push button object from the HTML page and select Create hyperlink from the context menu. You may change the name of the push button in the Display Text field. Drag the crosshair to add the image object. The image is added to the HTML page. You may adjust the image object to the size you want. Right-click the image object from the HTML page and select Create hyperlink from the context menu. You may change the name of the hyperlink in the Display Text field. From the Hyperlink Properties dialog box, select the New button to add a request to execute. Note: The Display Text field on the Hyperlink Properties dialog box is only available when inserting a push button or hyperlink as a schedule button. Select Schedule Report from the Action drop-down list. Select the Source drop-down list to select the source of your Schedule Report. The Source drop-down will only list the referenced procedures in the layout. 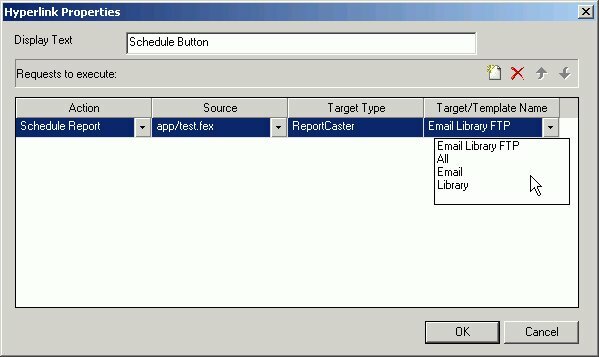 The Target Type option is disabled and defaults to ReportCaster when the Schedule Report action is selected. The Target/Template Name defaults to Email Library FTP when the Schedule Report action is selected. For more information on changing the template for the schedule page, see How to Change the Default Template for the Schedule Page. The schedule button, image, or hyperlink is added to the HTML page. Optionally, select the schedule object to view or edit the properties. The properties appear in the Properties window of HTML Composer. This procedure provides instructions on how to change the template for the schedule page by using the Hyperlink Properties dialog box. This is the template that appears when the schedule page is run from the report output. Select the Target/Template Name drop-down list to change the default template for the schedule. Email Library FTP - This is the default template. Note: The template names represent the type of distribution option for the schedule in ReportCaster. The selected template appears when the schedule page is run from your report output. When you run your report, select the parameters (if applicable), and click the schedule button. The ReportCaster schedule page appears. 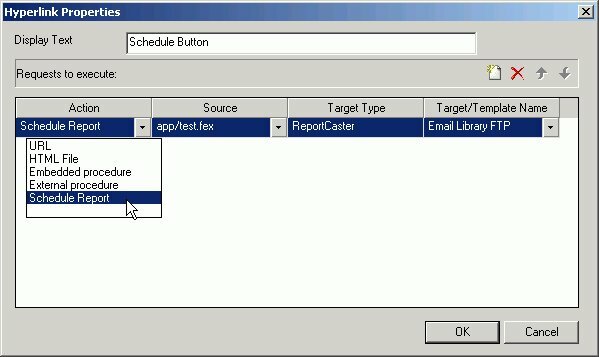 Tip: To change the schedule template that appears at run time, use the Hyperlink Properties dialog box to change the Target/Template Name. The report and the selected parameters are scheduled to ReportCaster. From ReportCaster, the values entered or selected are stored with the schedule information. You must have the Schedule user privilege to submit the schedule. 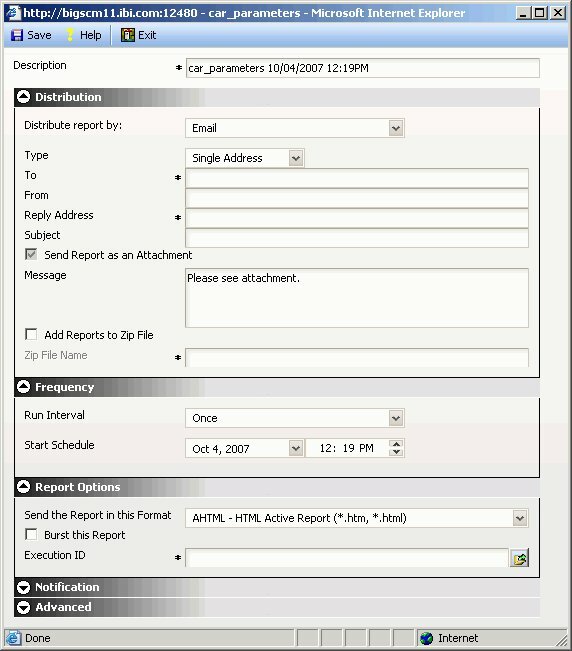 For more information about scheduling and distributing report output, see the ReportCaster manual.